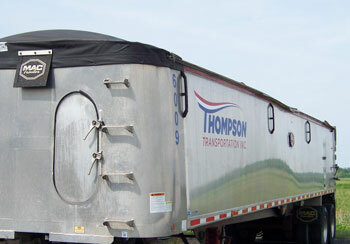 Thompson Transportation provides bulk end dump services to 47 states. Servicing 47 states (excluding California), our bulk division is 100% owner-operated, utilizing 40′ end dump trailers, transporting products such as roofing granules, scrap metals and alloys. We also offer brokerage services to ensure our customers receive superior service. “Miller and Company has been using Thompson Transportation for much of our end dump business for the past several years. From the onset of our relationship, Thompson has provided Miller and our customers with the highest quality service and superior reliability. Communication with Chris or Brad via phone or email is excellent. I can always expect a prompt, courteous reply to an order, question or quote request. They keep me well informed of any truck delays, or empty dump trucks they may have available in certain locations. In addition, their rates are very competitive, and even in cases where their rate may be higher, I would rather go with quality service and reliability over dollars, so I choose Thompson. It’s a name I’ve come to trust and depend on”.